CAD Schroer’s software support team has just gained the ISO 9001 stamp of approval for its quality management systems, with 5-star customer ratings. It joins the training department, which gained its ISO certification in 2009. Cambridge, UK and Pittsford, NY – 22 May 2013: Engineering software provider CAD Schroer has always counted on quality. In 2009, its training centre achieved ISO 9001:2008 certification. Now the support team is also quality certified, and has just received an “excellent” rating from customers. CAD Schroer, developer and supplier of design and data management software for manufacturers and engineers around the world, also provides standard as well as bespoke training, technical support, development and consultancy services. 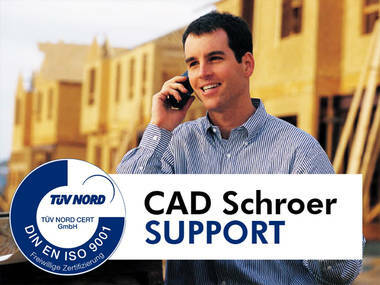 In order to highlight their commitment to customers and quality, CAD Schroer’s teams have worked hard to gain DIN EN ISO 9001:2008 certification. Among other requirements, the ISO 9001:2008 quality management systems standard expects organisations to effectively meet the needs of their customers, and constantly review and optimise business processes. 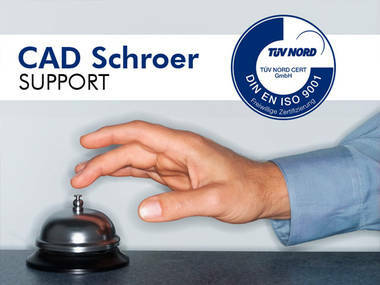 These and other important quality criteria were independently assessed by TÜV Nord in Germany, which especially commended the high degree of customer orientation in all of CAD Schroer’s existing processes, where customer feedback has always been critical for product and service optimisation. CAD Schroer offers certified training and support services for its entire product range, as well as bespoke workshops for customer-specific developments. Training is delivered flexibly at CAD Schroer’s support centres or at the customer site. Support includes a telephone hotline and an online portal.